Our workshops attract participants from all walks of life: enthusiastic woodworkers, semi-pro sea kayakers, traditionalists, and everything in between. Or sometimes, none of the above. Sometimes, people just need to get out from behind their desk, pick up a chisel, and get crafty. 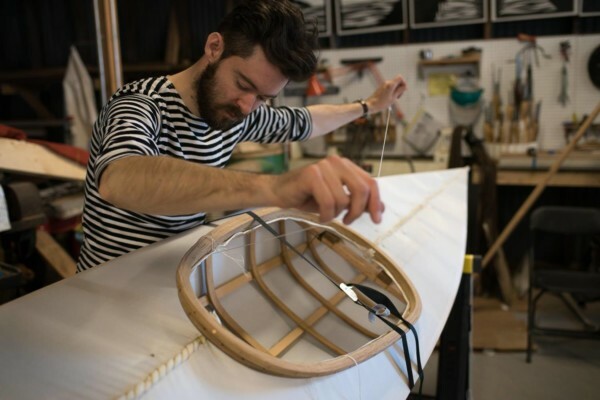 Last April, our friend Barney, over at the camera review site DPReview.com, got it in his head that he’d like to document the process of building a kayak. The result is a camera field test for the Canon EOS 80D—but just below the surface is the story of a young urbanite living out a boyhood dream he never knew he had. This video combines our three favorite things: kayak building, photography, and the drought-dry wit of our friend Barney Britton. Be warned: it’s a long video, but it’s a very good look at the entire process of building a kayak in our workshops. Sit back, relax, and watch Barney build his first kayak. Thank you to DPReview for letting us hang out with Barney for a week, Barney Britton for adding humor and striped shirts to our workshop, and We Our Shouting for making it all happen.